bonuses we have received from the earth. 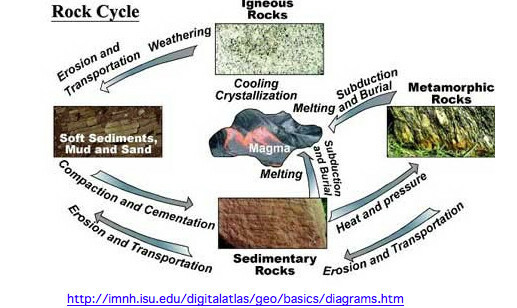 Concentrations of the earth materials we use are gifts of geologic forces – water, volcanoes, continental plate movement (subduction), pressure, time and heat. These gifts allow us to play and live. 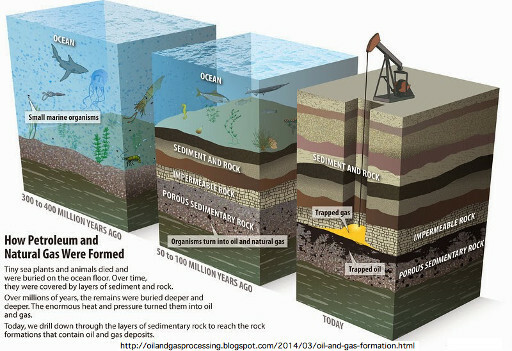 Minerals form within Earth or on Earth’s surface by natural processes. Minerals develop when atoms of one or more elements join together and crystals begin to grow. Recall that each type of mineral has its own chemical makeup. Therefore, what types of minerals form in an area depends in part on which elements are present there. Temperature and pressure also affect which minerals form. it. Minerals can form when the water evaporates. For example, when salt water evaporates, the atoms that make up halite, which is used as table salt, join to form crystals. Other minerals form from evaporation too, depending on the substances dissolved in the water. The mineral gypsum often forms as water evaporates. Hot water cools. As hot water within Earth’s crust moves through rocks, it can dissolve minerals. When the water cools, the dissolved minerals separate from the water and become solid again. In some cases, minerals are moved from one place to another. Gold can dissolve in hot water that moves through the crust. As the water cools and the gold becomes solid again, it can fill cracks in rocks. In other cases, the minerals that form are different from the ones that dissolved. Lead from the mineral galena can later become part of the mineral wulfenite as atoms join together into new minerals. Molten rock cools. Many minerals grow from magma. Magma— molten rock inside Earth—contains all the types of atoms that are found in minerals. As magma cools, the atoms join together to form different minerals. Minerals also form as lava cools. Lava is molten rock that has reached Earth’s surface. Quartz is one of the many minerals that crystallize from magma and lava. Heat and pressure cause changes. Heat and pressure within Earth cause new minerals to form as bonds between atoms break and join again. The mineral garnet can grow and replace the minerals chlorite and quartz as their atoms combine in new ways. The element carbon is present in some rocks. At high temperatures carbon forms the mineral graphite, which is used in pencils. Thermodynamic rarity . 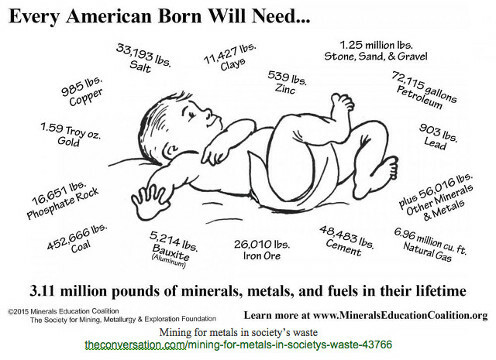 . . is understood as the free natural bonus provided by nature for having minerals concentrated in mines instead of dispersed throughout the crust (from Thanatia to the mine). There is a free natural bonus represented by the exergy replacement cost (ERC), defined as the exergy that would be needed to extract a mineral from ordinary rocks (Thanatia state) to the conditions of concentration and composition found in the mine, using prevailing technology. concentration of exergy required to reconcentrate a completely dispersed mineral in Thanatia back to the initial mine conditions. . . . Thermodynamic rarity varies from mineral to mineral, as is a function of a mineral’s absolute scarcity in nature and the state of technology. 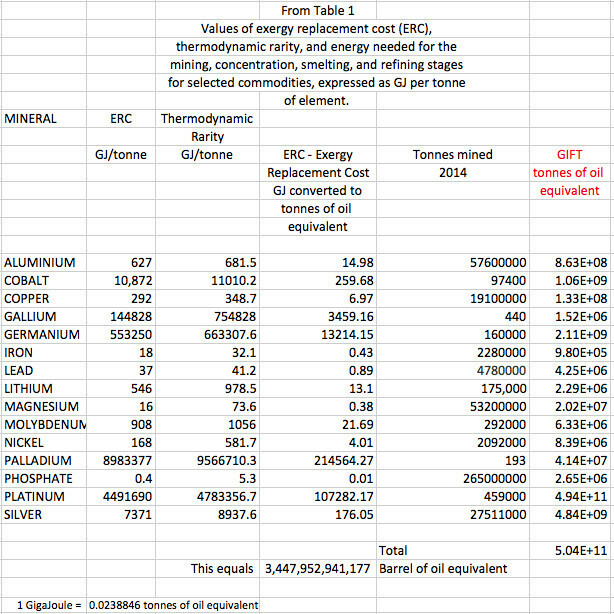 I took some of the minerals needed for our “future” and applied the Exergy Replacement Costs (see paragraphs above) to them. 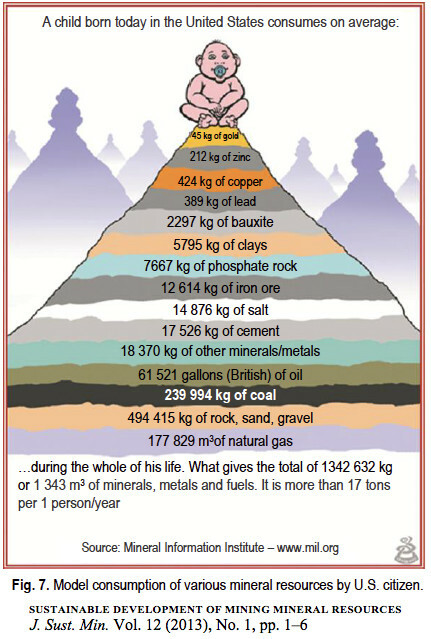 I converted them to tonnes of oil equivalent, researched the tonnes mined in 2014 and found the contribution of the earth in pressure, time, geologic movement, heat and life sources to the gifts of concentrated minerals in mines. As In the above essay on fossil fuels, we have received huge gifts of energy from our home. In 2016 the world used more than 35 billion barrels a year. The Web is each of these many things. Beyond these, it is everything. All life lives off the gifts of the earth. Processes of the earth have given us the chemicals on which life lives and breathes. Life shares in a wonderfully complex interaction that has been here from the beginning. The world of humans has used these gifts of the earth for sustenance and for materials from our beginning a few hundred thousand years ago. Since the advent of agriculture some 10,000 years ago, our use of our co-travelers and the material resources has grown and accelerated. 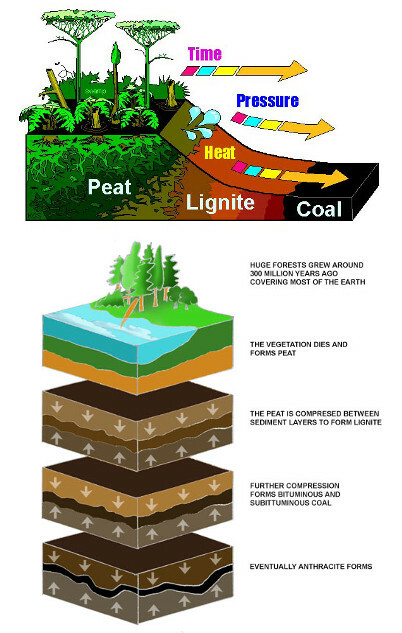 Fossil fuels are the legacies of ancient life, across time combined with earth pressure and earth heat. 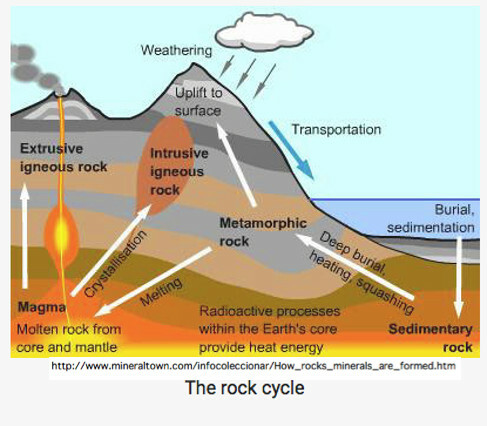 Concentrations of the earth materials we use are also contributions of geologic forces – water, volcanoes, continental plates, pressure, time and heat. These many gifts allow us to play and live. 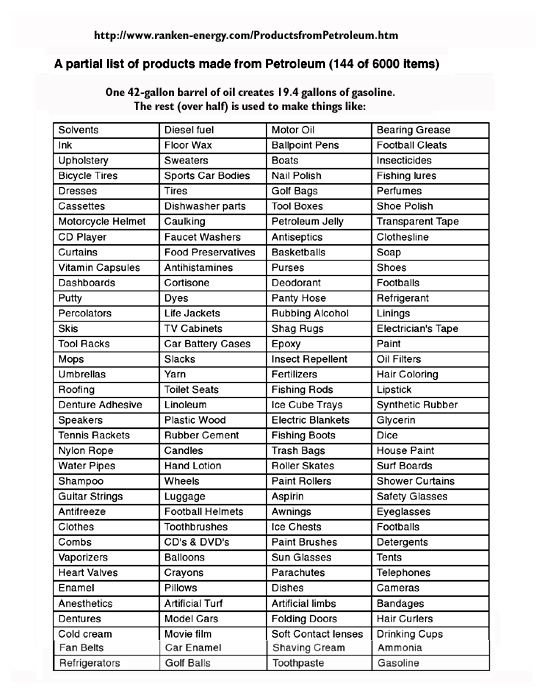 We use fossil fuels in many ways. Look around you. Almost every thing you touch has a history of fossil fuels. From the computer, to the truck that transported it, to the road the truck drove on, to the chair you are sitting on. Fossil fuels infuse our life. They provide our food from farm to process to store. They provide our clothes. They are the life “blood” of our world at present. An energy servant is a hypothetical replacement of human energy by fossil fuels. One barrel of oil is the equivalent of 8.6 years of human labor. 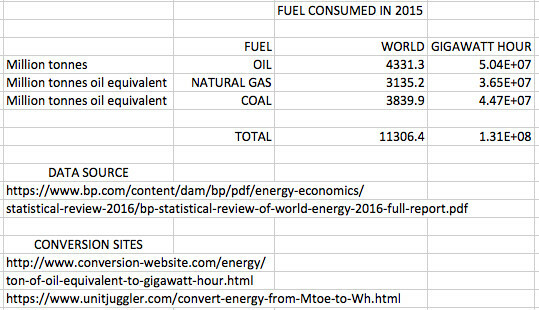 - this is the approximate number of energy slaves used globally in 2015 using fossil fuels. This does not include hydro, nuclear or “renewables”. The original term was “energy slave”. According to John Jones from the University of Aberdeen’s School of Engineering as many as 135 billion tonnes of crude oil have been extracted since commercial drilling began in 1850. How Much Natural Gas Have We Used? to the volume of a cube with sides of 1 kilometer. This equals 1,508,804,280 tonnes of oil equivalent. 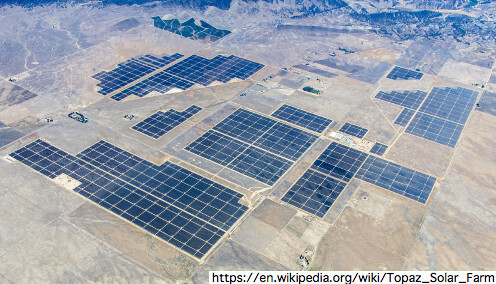 If we compare the 2015 contribution of fossil fuels to installed solar energy farms or wind energy farms, it gives an indication of how large an area would be needed to equal this contribution of fossil fuels in one year. With decreasing concentrations of many minerals thus requiring more energy to mine and process. 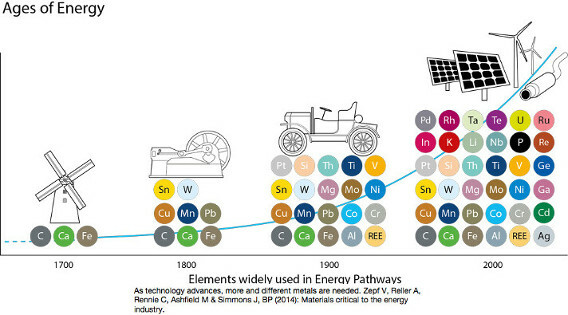 With the decreasing ERoEI of fossil fuels primarily petroleum also requires more energy to obtain. With many minerals and other materials requiring high temperatures (2000°C) to process, this will be an interesting future. This paper quantifies, on a global level, the relationship between ore grade and energy intensity. With the case of copper, the study has shown that the average copper ore grade is decreasing over time, while the energy consumption and the total material production in the mine increases. Analyzing only copper mines, the average ore grade has decreased approximately by 25% in just ten years. In that same period, the total energy consumption has increased at a higher rate than production (46% energy increase over 30% production increase).